A Sheffield advanced manufacturing company is doubling its workforce and increasing capacity at its premises to meet international customer demand. Sheffield Precision Medical (SPM) design and manufacture a comprehensive range of instruments used by orthopaedic surgeons around the world. The company is investing over £2 million in extending its Petre Street premises and installing new state of the art machines and systems, with plans to increase their skilled workforce from 27 to 53 employees over the next three years. Their expansion is in response to the growing export business, which currently accounts for 40% of the company’s £3.5 million turnover, with clients spanning Europe and the United States, and including Depuy, Corin and Biomet. SPM’s expansion strategy has been supported by Creative Sheffield – a partner in the South Yorkshire Sector Growth Enhancement Programme (SYSGEP). Support has included assisting the company to secure a Regional Growth Fund (RGF) grant from Sheffield City Region’s Local Enterprise Partnership “Unlocking Business Investment” programme. Creative Sheffield also assisted the company to develop strategic relationships with the region’s universities, and provided bespoke HR consultancy for the recruitment of graduates and apprentices, with SPM subsequently becoming ambassadors for the city’s RISE initiative. “The phenomenal expertise and skills of our design and manufacturing team, coupled with the full use of technology we are investing in, is taking us towards a very exciting future. “Sheffield Precision Medical is an ideal example of how the significant advanced materials and manufacturing expertise within Sheffield companies enables them to compete and win business internationally. “Sheffield Precision Medical provides its global client base with a manufacturing partner capable of providing high-quality, complete surgical instrument solutions, and we are delighted to be supporting their further expansion. “It is also great to see the company creating new skilled manufacturing jobs in the healthcare technologies industry, for which Sheffield has an ever growing reputation as a centre of international excellence. 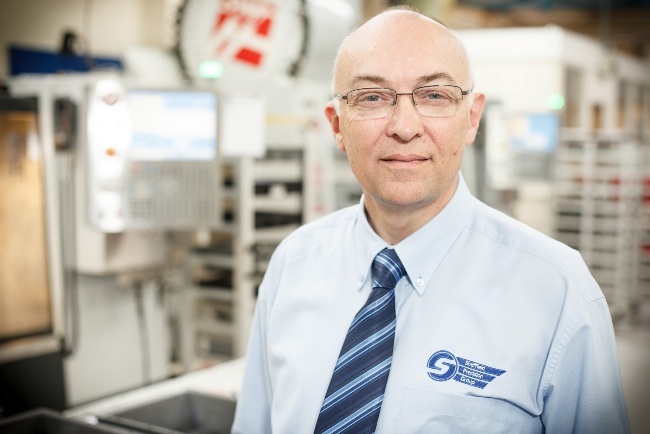 Brian bought SPM in 2010 after 30 years’ experience of the tool manufacturing industry. Last year the company produced over 50,000 components working in collaboration with designers in client companies to satisfy orders from single prototype to high volume requirements. SPM’s achievements have been recognised by the wider business community, earning them a number of awards including the 2012 “Made In Sheffield” Entrepreneurial Award and 2012 Medilink Export Achievement Award. “We specialise in offering our customers the complete solution from concept to completion. “The jobs we take on are complex and, because we ensure they are delivered to market on time and competitively priced companies come back to us time and time again.